What Off-The-Shelf Addition Did NASA Scientists Add To The Voyager Probes At The Last Minute? A Common Spike Used In Surveying Is Made From The Old Parts Of? You may use it to cover baking lasagna and wrap leftovers, but the humble aluminum foil found in your kitchen drawer has uses that extend well beyond culinary considerations. In fact, the farthest traveling space probes humanity has ever launched into space owe some of their longevity to the simple kitchen aide. Shortly before the Voyager program was set to launch, NASA scientists were more than a bit paranoid that deep space might be more hazardous than they imagined for the soon-to-prove-plucky little space probes. The only problem with delaying the mission was that it would scrap the entire project. The Voyager launches hinged on a planetary alignment that only occurs every 175 years. Any delay to fortify the probes with custom made shielding would delay them beyond the launch window and they’d miss the alignment they desperately needed to make the launch and travel path work. Rather than risk a failed mission after they had invested so much energy and money into the project, the scientists at NASA grabbed an off-the-shelf solution and got to work. Both probes received an upgrade before launch that included wrapping all of the cabling and critical connection points in off-the-shelf aluminum foil to protect them from extra radiation the scientists feared might be out there. 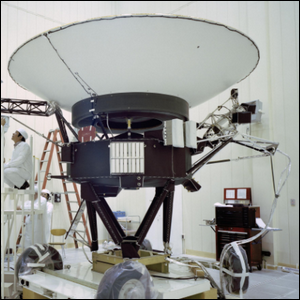 In the photo shown here of Voyager 2 being worked on in a clean room, you can see the cabling on the right-hand side is wrapped in layers of aluminum foil. That extra shielding most likely saved the day as both probes weathered the enormous radiation belts around Jupiter unscathed during their pass-by approach in 1979. Today, the probes are approximately 13.1 billion miles (Voyager 1) and 10.8 billion miles (Voyager 2) from Earth, thanks in no small part to the expert planning at NASA and that extra bit of off-the-shelf modification they enjoyed at the last minute.